The etching process that I use involves ferric chloride. A layer of hard ground (waxy, tar-like substance) is painted over the copper plate to protect it. Then a drawing is made using any variety of tools (I use an etching needle) through the hard ground to expose the copper. When placed in a bath of ferric chloride, the solution will eat away or corrode the areas where drawn lines fully exposed the copper. 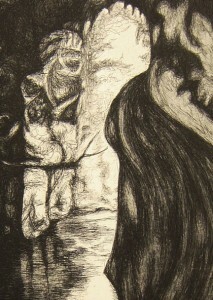 Etching is considered to be an intaglio technique. Intaglio refers to the printing process in which a plate is inked and wiped properly, and the remaining ink is held within the grooves and etched areas of the plate, unlike relief printing where ink is held on top of the surface and grooved areas remain white.